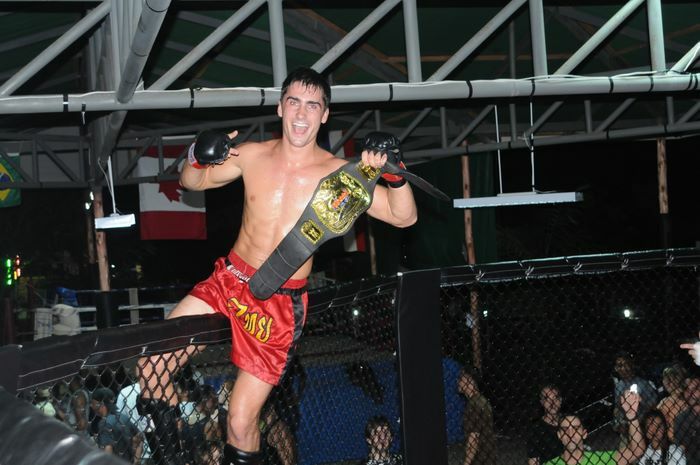 Tiger Muay Thai and MMA, training camp, Phuket, Thailand would like to congratulate Jason Saggo on his recent win in Ontario Canada. Fighting for the Live MMA promotion, Saggo competed on the main card for a promotion that featured MFC Star Ryan Ford, PRIDE FC vet Marcus Aurelio and UFC legend Karo Parisyan. . Heading into the bout against Derek Boyle, Jason Saggo was facing an opponent with nearly twice as many professional bouts on his record. Showcasing his submission grappling skills, Jason Saggo won midway through the third and final round with a RNC submission. Saggo has trained at Tiger Muay Thai several times in the past, and besides winning the BBQ Beatdown LW Grand Prix, captured the Pan Asian Gold medals for Brazilian Jiu Jitsu, and remained undefeated in his professional Muay Thai bouts while at Tiger Muay Thai and MMA Phuket. Look for Jason Saggo to return to TMT sometime in the future. With this recent victory Jason Saggo is now a perfect 5-0 with all bouts being finished via submission, Saggo is quickly establishing himself as one of the top LW’s in Canada not signed to a major promotion.